(15) 6’ x 3’ standard vinyl windows with cross-hatching. (4) 4’ x 3’ standard vinyl windows with cross-hatching. 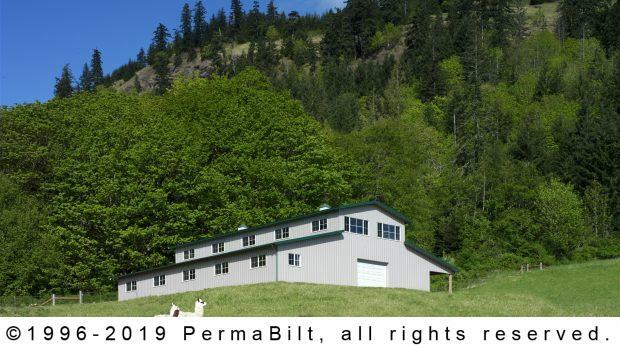 In Clallam County Washington, on a beautiful 34 acre piece of property, is a llama farm whose owner needed a home for her animals. 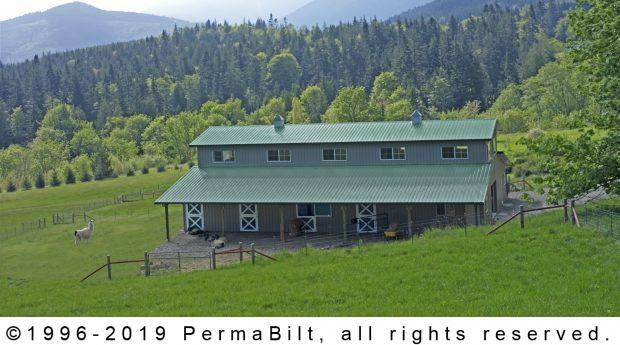 When sitting down with our PermaBilt® Building Representative to go over design, it became clear to our Port Angeles customer that her initial assessment of the barn needed to be bigger. So she decided on a monitor pole barn. Beyond it’s unique, classic barn shape, she appreciated the building’s roominess and hayloft storage for winter feed. She was ready to get going. The design she and her Building Representative ended up with a design which included two raised panel steel overhead doors with insulation and several walk-in doors. It also included four 4’ x 8’ steel Dutch doors which were ideal for her llama farm. Other elements added were windows, overhangs, cupolas, second story floor and staircase. As the materials were being delivered, one small mishap occurred. The lumber truck slid on the windy, winter road leading to the farm and overturned with the building supplies. We all quickly recovered, replaced any damaged material, and moved forward with construction all coming together to create a safe and secure haven for our customer’s llamas.